While fishing for snook this morning, we had a nice surprise when this 20 lb tarpon decided to hit the bait, and give us a great fight! After taking some pictures, we released the fish, unharmed. 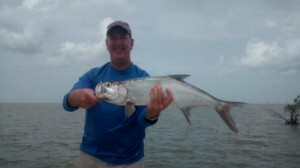 We also caught several nice snook, up to 12 lbs . Don’t miss out on some great action! Give me a call, and let’s go fishing!